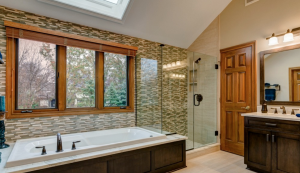 If you believe following traditional design norms can be boring, try integrating some fresh designing ideas into the bathroom redesigning project ahead. With a little creativity, you will be able to design new bathrooms that you’ll really want to spend some quality time in! Speaking of comfortable and bright ambiences, based on whatever you choose to add to your master bath, light can play a huge part in transforming the feel and look of any bathroom. In case you have fluorescent lights in the bath, you can replace them with something less dramatic, such as recess lights. If you can’t afford recess or the installation of new lights, simply change them with a less power consumption device, or one that has an adjustable wattage. You may also buy small counter lights that look stylish and add a decent change to the bathroom. Furthermore, you might consider adding curtains on the windows to create a more comfortable, home – like sensation; or just remove some of the lightning to create a more natural space and light. There is a whole world of alternatives when selecting the sink. You can even add an old-fashioned sideboard or bureau for a vanity in case you like that design, while sinks come in just about any shape and size. You may pick a unique color, finish, size, or design to include some unexpected style to the room. Materials comprise wood, glass, porcelain, metal, cast iron, solid surface, and enamel. The plethora of contemporary tile innovations has created a real flood of bathroom redesigning alternatives. Cover horizontal surfaces are available in many colors and designs in a range of shapes and sizes. The floor tiles for example, can continue vertically to the walls, enriching the colors and the textures of the room. You can use a range of tile dimensions in a coordinating palette of colors. Take your bath to a whole new level by adding a walk – in spot that’s not glass separated. Even if you do not have an extensive area, you can install a walk – in shower. It may be easy to neglect the seatings when you’re considering tubs and lavatories, but they also are an important component. If your bathroom redesigning plans feature a steam room or a large shower, you can install an integrated chase to let you recline as you shower or steam. Think about the feeling of restfulness and comfort as you relax, laying back in this luxury. If modern sound and visual technology attracts you, don’t let any traditional norms stop you. You can add wall -mounted, water-resistant TV-sets, visible from the tub or the shower, which will let you watch TV while taking a bath. You can also select between different mirror TVs that are decorative mirrors with a capability of working as a TV-set. These TVs have extra features, like lights, radio and even water-resistant remote controls. Another device to think about is a showerhead-speaker, letting you connect all devices via Bluetooth. With all the options available, there is no reason for you not to have fun remodeling your bathroom! Just wait and see where innovation and creativity can take you -you will be astounded.